It's Thursday, so it must be time to learn more about Jean La Forêt's experiences in the U.S. Army! I hope this week's segment lives up to the excitement of last week's bounty on Jean's head. Because the last entry on the fourth page rolled over to the next page, I've included that piece this week.
" – 4 – Grande parade à S.F. Saluons le "Duquesne" bâtiment de guerre français, Amiral Lefèvre. Marseillaise par la musique du Regiment. Juillet. 8. Quittons San Francisco pour Monterey, passant par Boots Parc, San Matéo, Menlo Park, Mountain View, Saratoga, Alma, Soquel, Watsonville, Castroville. Août – 11 – Quitte l'armée. Août – 16 – Quitte Monterey pour San Francisco. Août 19 – Quitte San Francisco pour Hoopa Valley. Oct. 19 Un parti de six assassins essayent de m'assassiner. Je dois la vie à mon revolver et à mon sang froid, mais aussi un peu à Hattie. Dec. 24 Mes ennemis essayent d'acheter un indien pour me tuer d'embuscade. L'indien a peur et me prévient. Mars – 1 – Quitte Crescent City pour San Francisco où j'arrive le 2(?) Mars. 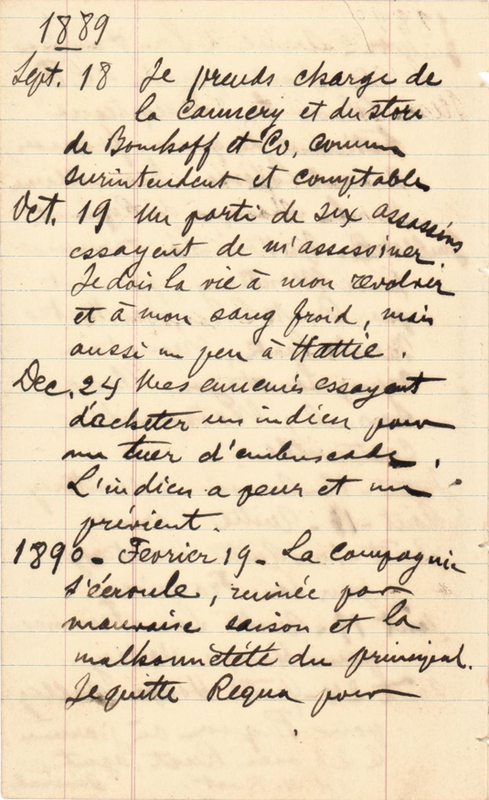 Mais – 14 – Vais à Athlone avec Mr. Wilson B. Morse je reste sur sa proprieté jusqu'en Juin 14. Juin 20 – A San José retourne S.F. le 22. Août – 26 – Entre le Corp de la Marine à Mare Island et j'y reste jusqu'au 1er Novembre. Nov. 1 Pars de Mare Island pour San Francisco pour l'Alaska. Embarque à San Francisco le 1er 10h. du matin sur l'"Umatilla" avec détachement de cinq marines et six marins. Nov. 4 Arrivons à Port Townsend, Washington d'où nous repartons le 7 Nov. avec steamer "City of Topeka". Nov. 14 – Arrivons à Sitka, Alaska où nous restons jusqu'à nouvel ordre, sous les ordres de Capt. Fahrenholt, du navire de guerre "Pinta". Les marines vont à bord et nous restons à terre, cantonnés dans un vieux bâtiment appartenant autrefois au gouvernement Russe.
" 4 – Big parade in San Francisco. We welcome the Duquesne, a French warship, Admiral Lefèvre. "Marseillaise" with music from the regiment. July 8. We leave San Francisco for Monterey, passing through Boots Parc, San Mateo, Menlo Park, Mountain View, Saratoga, Alma, Soquel, Watsonville, Castroville. August 11 – Quit the Army. 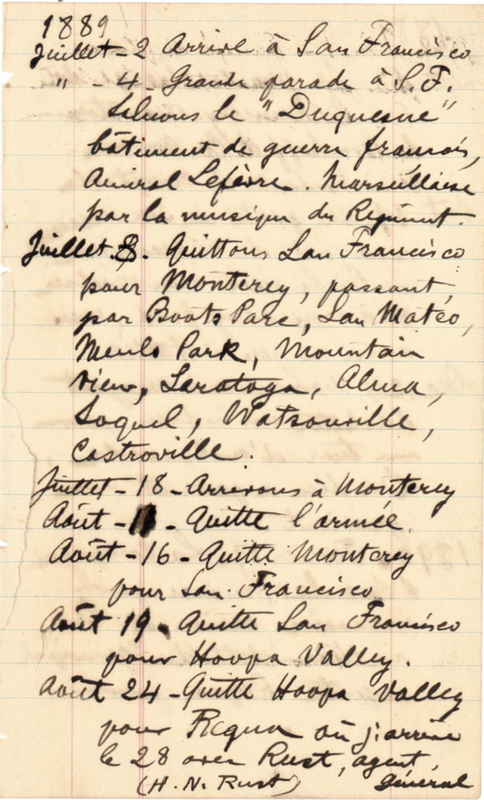 August 16 – Leave Monterey for San Francisco. August 19 – Leave San Francisco for Hoopa Valley. October 19 A party of six assassins tries to kill me. I owe my life to my revolver and my composure, but also a little to Hattie. December 24 My enemies try to pay an Indian to kill me in an ambush. The Indian is afraid and warns me. March 1 – Leave Crescent City for San Francisco, where I arrive March 2(?). May 14 – Go to Athlone with Mr. Wilson B. Morse I stay on his property until June 14. June 20 – To San Jose return S.F. the 22nd. August 26 – Enlist in the Marine Corps at Mare Island and stay there until November 1. November 1 Leave Mare Island for San Francisco and then Alaska. Embark in San Francisco on the 1st at 10:00 a.m. on the Umatilla with a detachment of five marines and six sailors. November 4 Arrive at Port Townsend, Washington from which we leave on November 7 with the steamer City of Topeka. 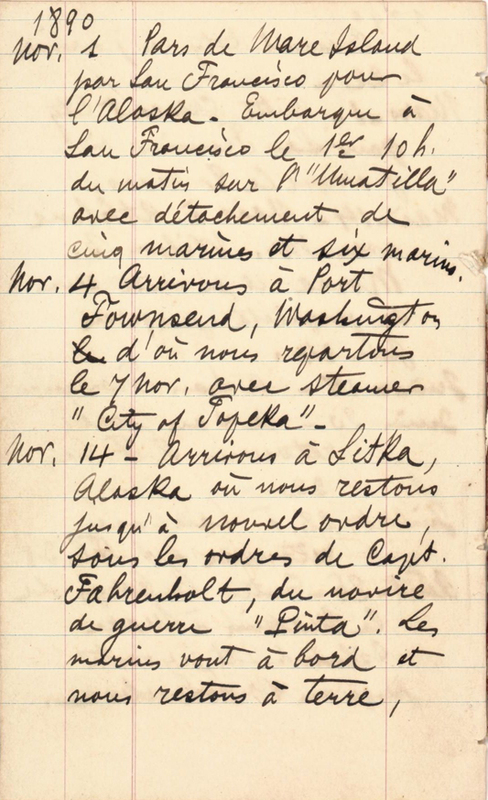 November 14 – Arrive at Sitka, Alaska where we stay until new orders, under the command of Capt. Fahrenholt, of the warship Pinta. The marines go on board and then stay ashore, billeted in an old building that formerly belonged to the Russian government. I promise I had not read these journal entries before I wrote the intro paragraph to this post, where I said that I hoped this week would live up to last week's excitement. But it sure did! Six assassins tried to kill Jean? And then an Indian is hired to kill him, but is afraid and tells him about it? How in the world did this man survive to marry Emma? Moving past that, Jean left the Army on August 11, 1889 and went right back to Requa, which he had left on June 22, not even two months earlier, apparently after a court case that didn't go his way. And then he took a job running a company there. This sounds kind of squirrelly to me, but it might have all been aboveboard. Maybe it wasn't, and that has something to do with the assassination attempt. But his separation date from the Army was exactly five years after his enlistment, so that may have been the term he signed up for. When Emma applied for a pension, she said he was discharged on August 10, a minor discrepancy. Five months later the company fell apart. Jean bounced around for a while, staying for a month in Athlone before returning to the San Francisco area. And then what did he do? He joined the Marines on August 26, 1890. Maybe he missed military discipline (and a regular paycheck and meals). 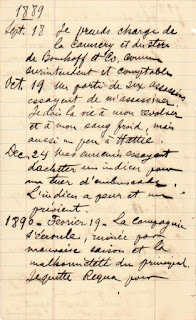 Something intereresting to note is what Jean did not write in his diary. 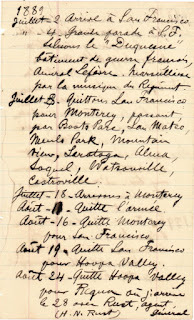 According to Emma's 1917 emergency passport application, Jean was naturalized as a U.S. citizen in San Francisco on March 22, 1890. Yet Jean doesn't mention that at all. At the time I described that passport application, I questioned Emma's statement that Jean had lived uninterruptedly in San Francisco from 1884 to 1909. 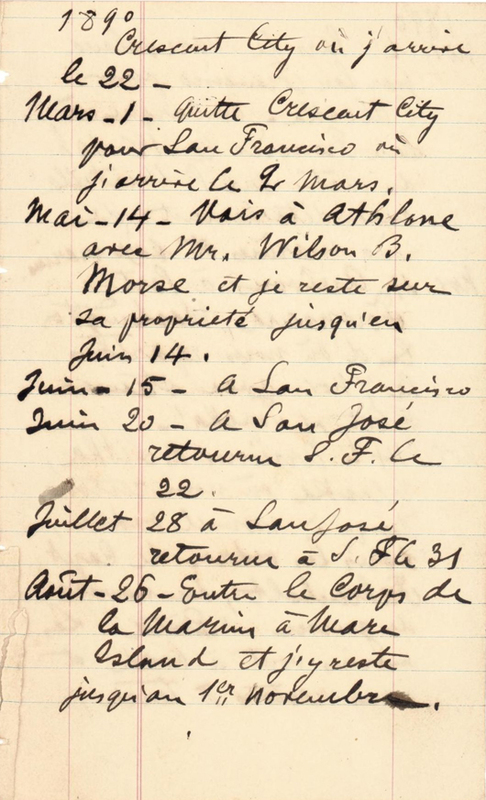 I'm only up to the end of 1890 in Jean's diary, and so far he lived in New York (where he enlisted in the Army), San Francisco, Requa, and Athlone. 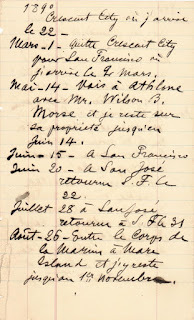 The first time he was even in San Francisco was July 10, 1886, and he left after four days. So yeah, Emma pretty much blew that one. Maybe that's what Jean told her? Captain Fahrenholt, under whose command Jean came in November 1890, was Oscar Walter Fahrenholt, who later became a rear admiral in the Navy. I'm still working on just who H. N. Rust was. Thank you for mentioning thais. 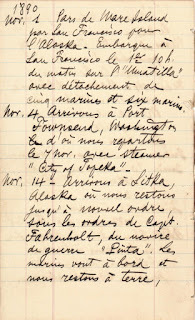 I remember writing about that point and wondering why Alaska was considered foreign service, although it took me a while to find the relevant post (http://www.ancestraldiscoveries.com/2016/11/treasure-chest-thursday-jean-la-forets.html), because you placed your comment on a different page. Does "overseas" military service count as "foreign" saervice? Or was Jean simply using the term "foreign" to designate what the military would have called "overseas?" If so, then I am less confused about Jean calling out those service periods specifically.